Take in a night of sushi and Star Wars with these Star Wars Darth Vader Light-Up Chopsticks! These chopsticks illuminate with a bright inner red light, just like Darth Vader's lightsaber from the classic George Lucas films. 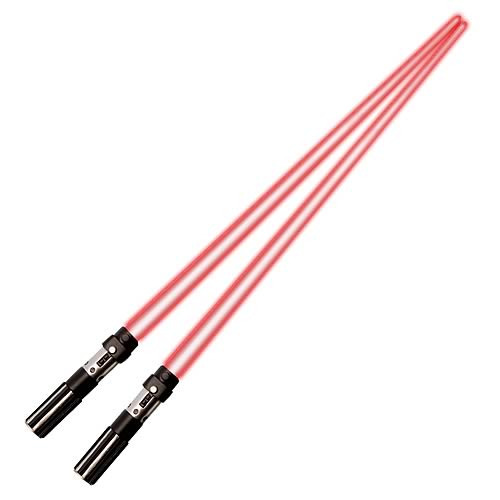 With a simple twist of the highly detailed lightsaber hilt the blades glow crimson so you'll never have to eat in the dark. With detachable lightsaber blades and a larger, sturdier size (over 9-inches long) for easy and safe cleaning these chopsticks are fun for the whole family. You'll never want to use the fork again when you've got these Star Wars Darth Vader Light-Up Chopsticks! Requires 4x "LR41" batteries, Included. Ages 14 and up.